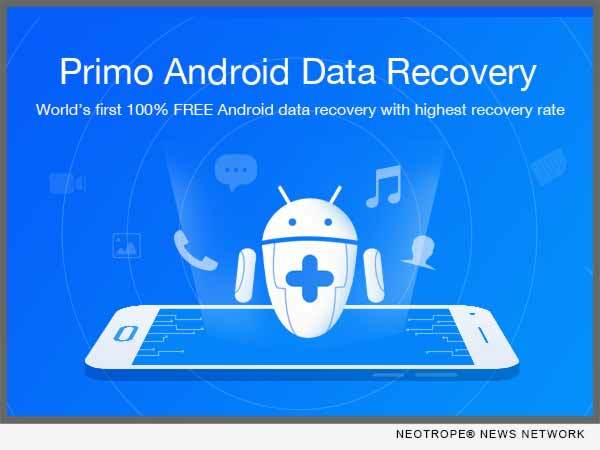 LOS ANGELES, Calif. /California Newswire/ — PrimoSync Inc., a pioneering developer of iOS and Android, today proudly released its 100 percent FREE and competent data recovery flagship – Primo Android Data Recovery for all Android users. Embedded with the most innovative technology, it fully helps Android users deep-scan every inch of data to make sure of the highest data recovery rate. The most exciting aspect is that it’s totally FREE, offering ultrafast scan and recovery speed to rescue lost or deleted messages, photos, contacts and more from ANY Android phone or tablet. Primo Android Data Recovery is the world’s first — yet the ONLY 100 percent FREE — Android data recovery tool with highest success rate! Now, no more free trial, and you are absolutely free to download, scan, and even recover everything back with no limitations and no hidden fees. Built on the newly patented technology, Primo Android Data Recovery scans deeper than ever to ensure you get back your lost or deleted data at the maximum data recovery rate. No more worries, and you can salvage your lost-but-valued photos, messages, contacts, call logs and more without any hassle. Armed with industry-leading data scan and recovery speed, Primo Android Data Recovery digs out the targeted lost files faster than ever. With it, you are able to get back your precious data in no time just as you had them before. Last but not the least, Primo Android Data Recovery perfectly supports any Android smartphone, including SAMSUNG, Google, SONY, HTC, HUAWEI, MOTOROLA, LG, etc. Plus, it runs well on Android 4.0 or later.